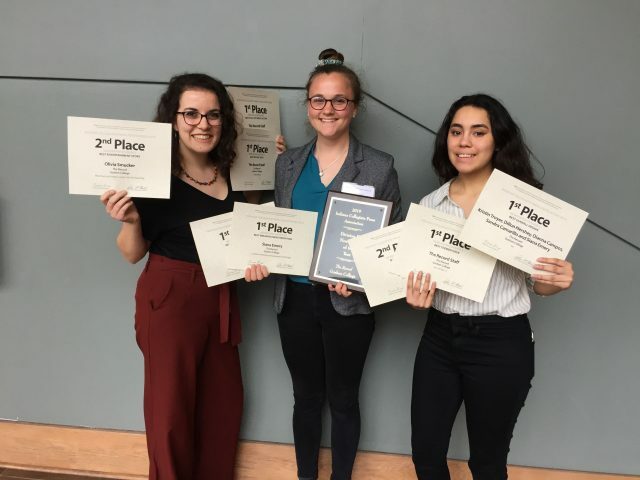 It was a thrilling weekend for The Record as the weekly newspaper scored the Indiana Collegiate Press Association’s Division III “Newspaper of the Year” award for the second consecutive year. This was the third time in four years that The Record received this recognition. The award, which is given to weekly college newspapers with a student population of less than 3,000, was given to The Record in response to the 34 awards received by staff, writers and photographers who participated in The Record last year. The semesters included in this year’s ICPA contest were spring 2018, when 2018 graduate Emily Kaufmann was editor, and fall 2018 when senior Kristin Troyer was editor. Artistic choices were also celebrated, such as Dillon Hershey’s best feature photo award, for “painting a picture of hope” in covering the 40th anniversary of the Umble Center, as well as Juan Perez’s first place sports photo, for “capturing just the right angle and moment when a runner pulls from the pack” in cross country. Besides the 16 first place awards received, Goshen students also took home a number of second place accolades, including a second place awards for Sandra Camarillo, Hershey, Troyer, Jill Steinmetz and Bryce Yoder for overall design and Nick Yutzy’s sports feature profiling Aleksander Rabadzhiev, a volleyball standout from Bulgaria. Third place awards included best review, given to Kory Stoneburner-Betts for a review of the Yamato drummers at Sauder Concert Hall. 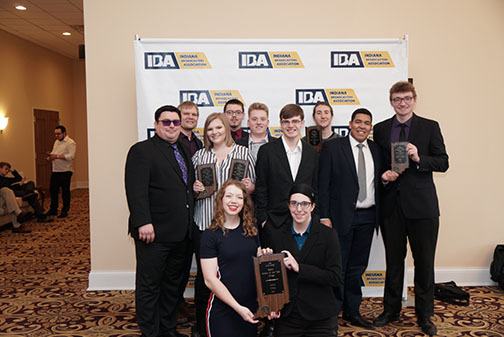 Meanwhile, in nearby Carmel, Indiana, the Goshen College Globe Radio & TV student team when they won their fifth “Radio School of the Year” award this past Saturday. This state championship title for the radio station joins the winners from 2012, 2013, 2014 and 2016. The five titles is the most by any school since the competition was first held in 2005. This honor accompanies 11 individual awards for Globe Radio, as well as seven awards received by the Globe TV’s student staff. Among the Goshen College attendees were a number multiple award winners as a part of the student staff, including Riley Friesner, junior broadcasting major from Elkhart, Indiana, who won first place in three categories: Radio Air Personality, Radio Show and Radio Newscast as well as a third place selection in Photojournalism. Sophomore Kadie Spoor was named an Indiana Broadcasters Foundation scholar, one of only ten students in the state.